Planning your next charity ball, gala fundraiser, or corporate holiday party? We can create stunning first impressions with exquisite paper details that helps get more of your targeted audience to your event. When you maximize your attendance, you are able to raise more for your cause. Eye catching invitations from Be In Love Designs is the way to do this. 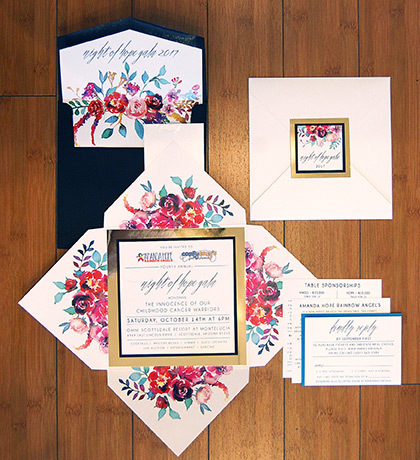 We will work with your gala chair or chosen planner to pick out beautiful papers and styles of invitations that are cohesive with your events theme. We can also work within your company’s branding guidelines and use your fonts and colors, as well as your organizations logos. Once we have a design together, we can also address, stuff, stamp and mail if needed. Besides invitations, we can also create programs, menus, table numbers, bid cards, posters and more for your fundraising, charity or corporate event. The possibilities on what we can brand for you event are endless! We also know that these events tend to repeat every year. And we look forward to creating designs every year for your charity ball, gala, and corporate events! That is why we give a small discount to our returning clients as an added bonus and thank you for choosing us.